Reaction Commerce | Guess Who Won at Shoptalk 2016? Guess Who Won at Shoptalk 2016? Last week, over 3,000 attendees descended upon the Aria Hotel in Las Vegas, NV, to attend Shoptalk, a next-gen retail and ecommerce summit for both startups and seasoned vets alike. We were at the three-day conference to compete in a rapid-fire Startup Pitch competition, where our very own Sara Hicks repped Reaction by giving a quick run-down on the state of ecommerce, from its past to its present to its future. @shoptalk @getreaction Thanks! I'm looking forward to telling the world about Reaction Commerce! Every decade, technology experiences huge developmental shifts: the era of the mainframe, the rise of the PC, the birth of the World Wide Web. Today, we live in a world where global connection sits conveniently at our fingertips through our mobile devices. But when it comes to retail sites and platforms, it almost feels as if we’re still living in the Ottoman Empire. Slow page loads, static merchandising, cumbersome codebases, and hefty price tags still plague today’s ecommerce solutions, and that’s because most retail sites are still being built on platform technology suited for the Web era, not for connected devices. In order to take things to the next level, you’ll need a real-time, open-source platform, fit for today’s modern era. Sara presented Reaction, a real-time reactive, mobile responsive, and cross-platform compatible platform, as the world’s first intelligent commerce platform, built on a scalable, full-stack cloud platform, that would convert potential customers to actual customers. Fifteen early-stage ecommerce companies were given the opportunity to present their product in a 3-minute pitch, followed by a Q&A from a panel of judges. The winner, selected by the judges, went on to receive a grand cash prize of $25,000. Congrats to @getreaction and @useShopic Winners of 1st #shoptalk pitch contest! It was awesome walking around the casino carrying a big check, but now our prize sits proudly on display here at HQ. 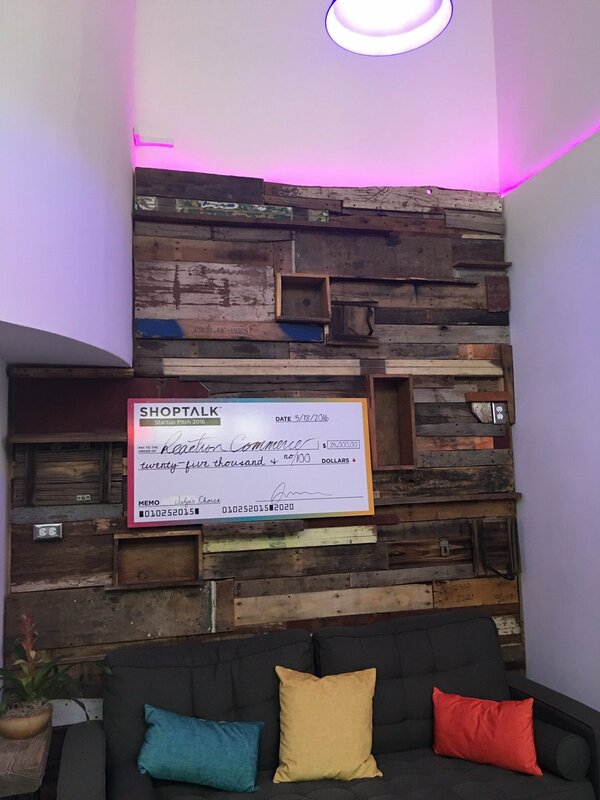 Thanks again, Shoptalk! We had a blast.